Dead Sea is a large salt lake, east of the Judean desert. Many nature and ancient sites are located around the lake. 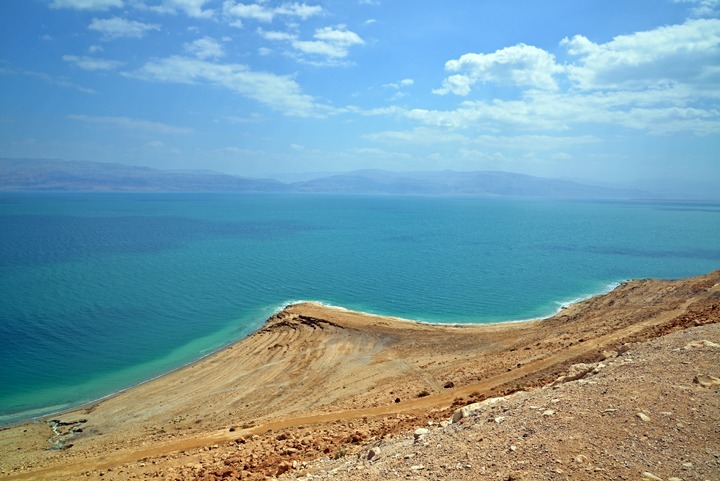 (Genesis 14 3): "All these were joined together in the vale of Siddim, which is the salt sea"
The Dead sea is a large salt lake east of the Judean desert. This is the deepest place in the world, situated on the Great Rift Valley (Syrian-African depression). Many points of interest are located around the lake, with nature reserves and ancient sites such as Masada, Ein Gedi and Qumran. It is one of the saltiest water bodies in the world - 34% - which gave it the Hebrew name "salt sea" (Joshua 15:5): "And the east border was the salt sea, even unto the end of Jordan". 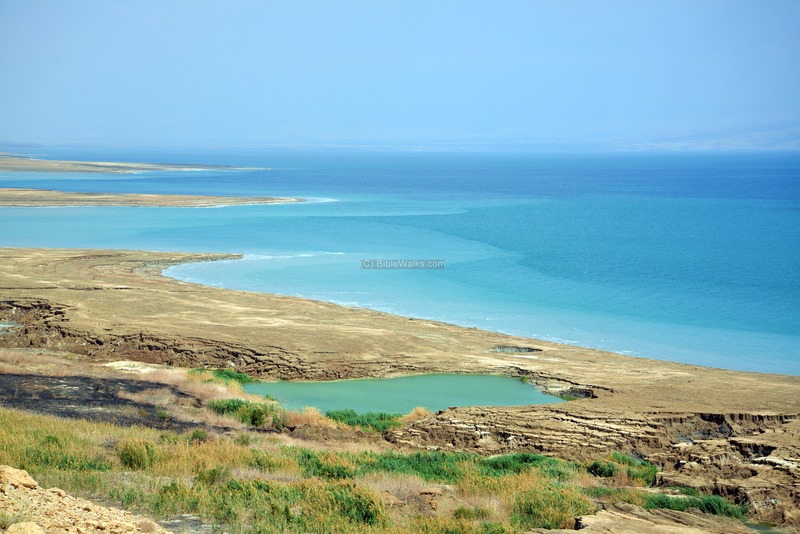 The salt levels makes life inside the water impossible, hence the name "dead" sea. This overview page presents some of the scenes of the Dead Sea, and also points to the sites featured in BibleWalks.com. The Dead Sea is located to the east of the Judean desert, between Israel and Jordan. Its level is 420m under the sea level. The southern part of the lake is mostly dry or broken into evaporation pools. The shore along its western section is narrow, and may extend to 2-3 KM at the outlets of the brooks that flow from the Judean desert. The area is seen here in a satellite photo, with an indication of the sites reviewed in Biblewalks. You can point on the yellow squares to navigate to the selected place. The Dead Sea is part of the Great Rift Valley (Syrian-African depression), which runs from northern Syria to the South East Africa (6,000 KM long). It started to evolve 25 Million years ago, due to tectonic pressures of plates. At that time the depression, in this section, was covered by Ocean water. Due to the heat and dryness of the area, the water evaporated, and salt accumulated at the bottom of the lake. About 2 million years ago the depression at the area of the Dead Sea was cut off from the Ocean, and a great lake was formed. The accumulation of salt formed a large body of accumulated salt on the bottom of the lake. The Dead Sea is first referred in the war of the four kings against the five kings of the Dead Sea area (Genesis 14 3): "All these were joined together in the vale of Siddim, which is the salt sea". The five kings lost the battle, falling into slime (mud) pits (Genesis 14 10): "And the vale of Siddim was full of slime pits; and the kings of Sodom and Gomorrah fled, and fell there; and they that remained fled to the mountain". The Bible tells about the destruction of Sodom and Gomorrah, the cities located on the south-east side of the Dead Sea (Genesis 19 28): "And he looked toward Sodom and Gomorrah, and toward all the land of the plain, and beheld, and, lo, the smoke of the country went up as the smoke of a furnace". Lot, his wife and two daughters escaped just before the wicked city was destroyed, and fled to the outskirts of the nearby city of Zoar. Zoar is also mentioned in the Bible in connection to the departing of Abraham and Lot (Genesis 13, 10): "And Lot lifted up his eyes, and beheld all the plain of Jordan, that it was well watered every where, before the LORD destroyed Sodom and Gomorrah, even as the garden of the LORD, like the land of Egypt, as thou comest unto Zoar". Zoar and the lost cities of Sodom and Gomorrah are presumed to be located in the plain on the south side of the Dead Sea. The cities and roads during these periods are indicated on the Biblical Map below. The area of Ein Gedi, on the west of the center of the Dead Sea, is where David hid from the pursuing King Saul (1 Samuel 23 29: "And David went up from thence, and dwelt in strong holds at Engedi"). During the Israelite Kingdom (9th/8th C BC), there were several roads that crossed the Judean desert down to the Dead Sea, with fortresses guarding these routes and the eastern flank of the Kingdom. Ruins of one of the fortresses were located on the cliffs above Nahal Zohar, which may have protected the "Edom" way (2 Kings 3 5-8): "the way through the wilderness of Edom". The village of Ein Gedi was established in the 7th C BC, during the Judean Kingdom. A seal was found bearing the name "Uriyahu son of Azaryahu", perhaps belonging to an official Judean clerk around the 6-7th C BC. The ancient town of Ein Gedi and the delta of Bokek were prosperous in the Hellenistic and Roman period. Their wealth was based on dates, vegetation, and the precious balsam (persimmon, Hebrew: "afarsemmon") which was used to manufacture perfume (Hebrew: bosem). The Balsam was cultivated and processed in the delta of the Bokek brook. 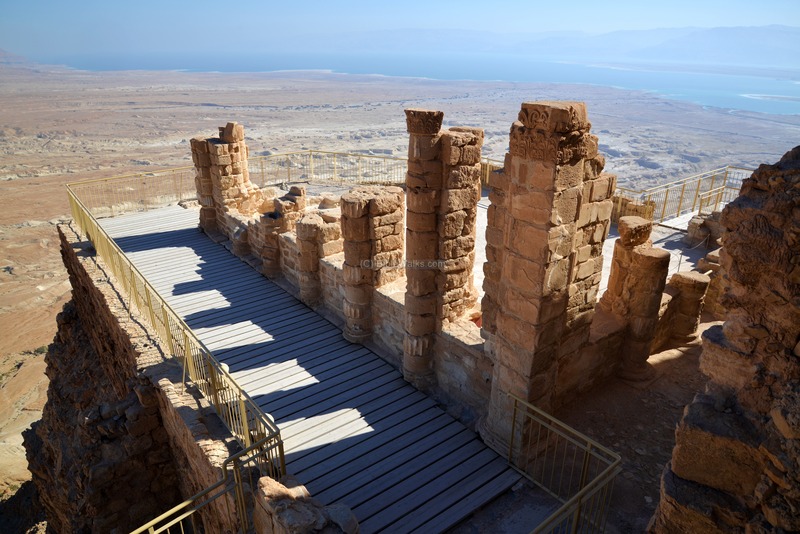 The Hasmoneans first fortified Masada on a high cliff above the Dead Sea, and was one of their desert fortresses which stored their treasures and supplies, as well as protected their eastern front. Later, King Herod built a winter palace and fortress. During the Great Revolt against the Romans, the fortress became the last stronghold to fall (70 AD). The Dead Sea was positioned on the eastern frontier of the Roman empire - the Limes Arabicus. This border line extended 1,500km from Northern Syria to the Red Sea, and its defense was based on forts, watchtowers and connecting roads. These protected the empire from attacks of the barbarian tribes of the Arabian desert. At the end of the 3rd C the Limes was restructured by Diocletian, renamed to Limes Palaestinae. The fort was constructed several years later in order to enforce the border line. Along the western side of the Dead Sea are several fortresses, such as in Bokek and Zohar brooks. 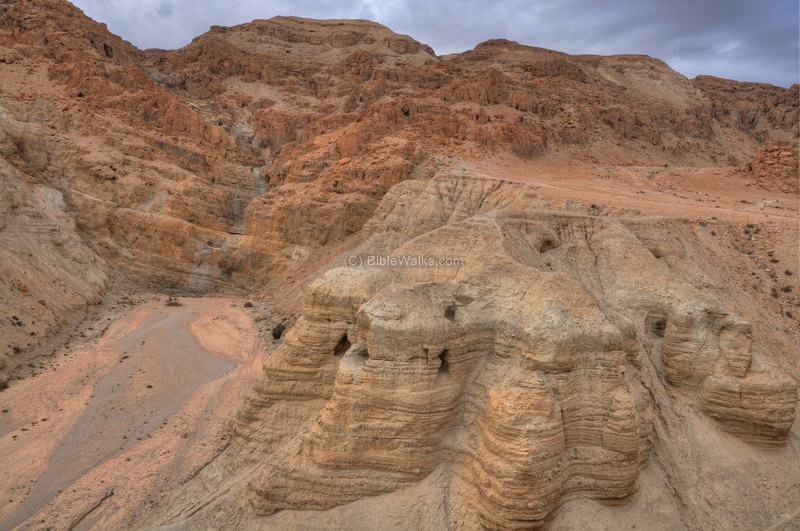 The mountains of Sodom are located on the south-west side of the Dead Sea, rising 150-250m above it. Sodom is mentioned in the Bible in connection to the destruction of Sodom and Gomorrah (Genesis 19 28): "And he looked toward Sodom and Gomorrah, and toward all the land of the plain, and beheld, and, lo, the smoke of the country went up as the smoke of a furnace". The location of the ancient city is not known, yet in modern Israel the area of Sodom (Hebrew: Sedom) is located on the south-west side. 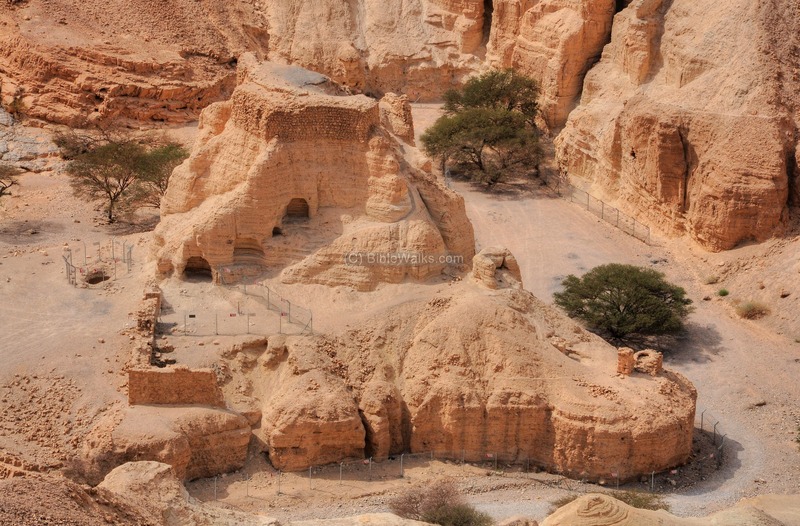 For more information on Sodom area, check the pages of Sodom Caves and Dead Sea works. Ein Gedi (Kid spring) is located on the western shore of the Dead Sea, and is the largest desert oasis in Israel. It is watered by four springs. Its fresh waters made the settlement possible since ancient times, and was referred several times in the Bible as a fertile place. Ein Gedi was prosperous in the Hellenistic and Roman period, its wealth based on its famous dates, vegetation, and the precious balsam which was used to manufacture perfume. The site was known in the Biblical times as fertile, blessed by the spring it is named after. This area is where David hid from the pursuing King Saul (1 Samuel 23 29: "And David went up from thence, and dwelt in strong holds at Engedi"). 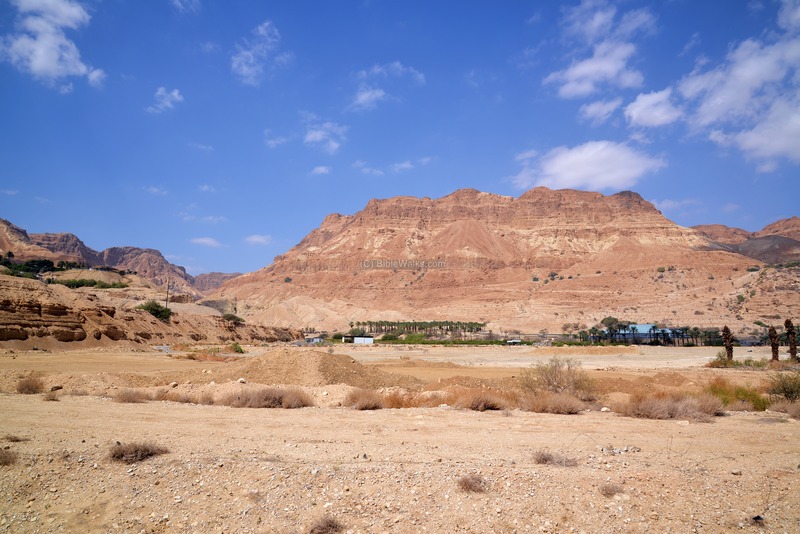 For more information on Ein Gedi and sites around it, check the pages of Ein Gedi, Nahal David, Nahal Hever and Nahal Arugot. Masada is located on a steep and isolated hill on the edge of the Judean desert mountains, on the shores of the Dead Sea. It was the last and most important fortress of the great Jewish rebellion against Rome (66-73 AD), and one of the most impressive archaeological sites in Israel. For more information on the area of Masada, check the page of this incredible place. In Qumran, located above the shore on the north-west side of the Dead Sea, are the ruins of a famous Roman period settlement. This was the home of the Essenes, a break-away sect. 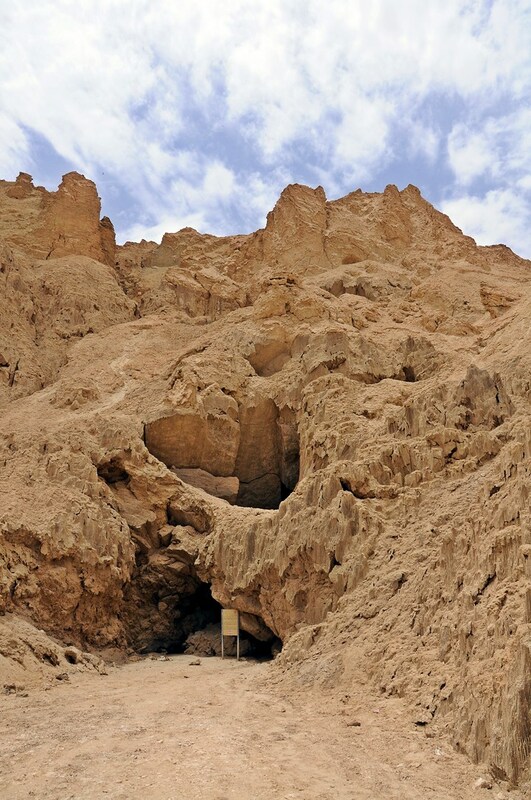 Many of the Dead Sea scrolls, hidden in jars, were discovered in these caves near the site. For more information on the Qumran, check its page. 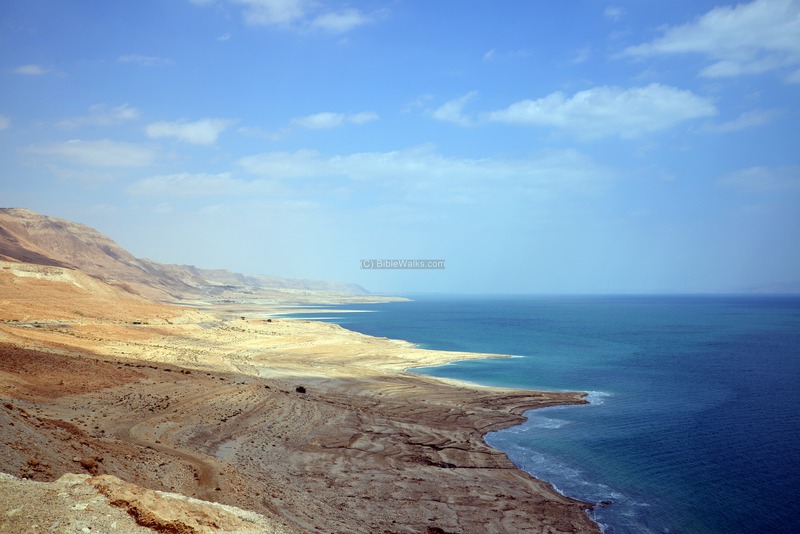 Nahal Bokek and Nahal Zohar are brook which flow into the south-western side of the Dead Sea. Ruins of Roman/Byzantine fortresses, as well as other ancient sites, are located there. For more information, check the pages of Nahal Zohar and Nahal Bokek. There are many public beaches along the shore of the Dead Sea. This picture is from Kalia Beach, on the northern section of the Dead Sea, close to the Jordan river's entry to the lake. The bathers often cover their face (as below) and body with the black mud of the Dead Sea. The mud sourced from the Dead sea is a deposit found on the surface of the lake, rich with minerals, and is famous for relieving muscle aches, pain and stress. The high level of salt in the water pushes the body upwards, so the body floats above the surface of the water. 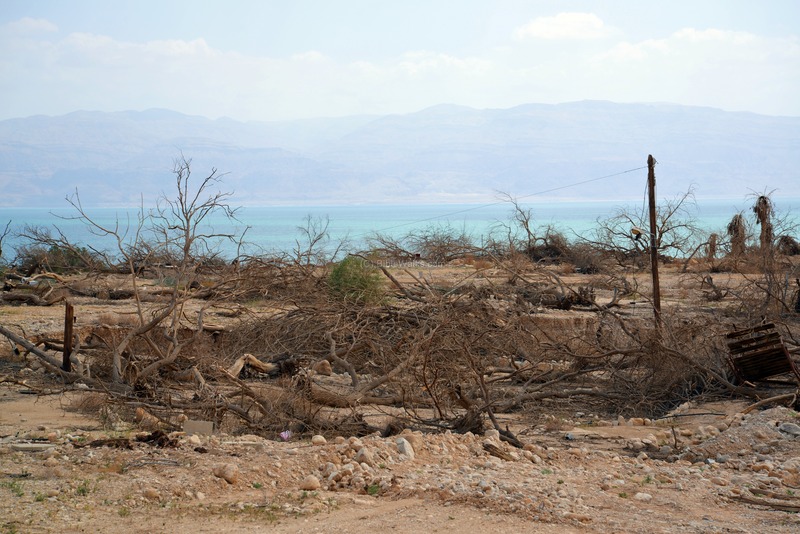 The Dead Sea water level is retreating in recent years. 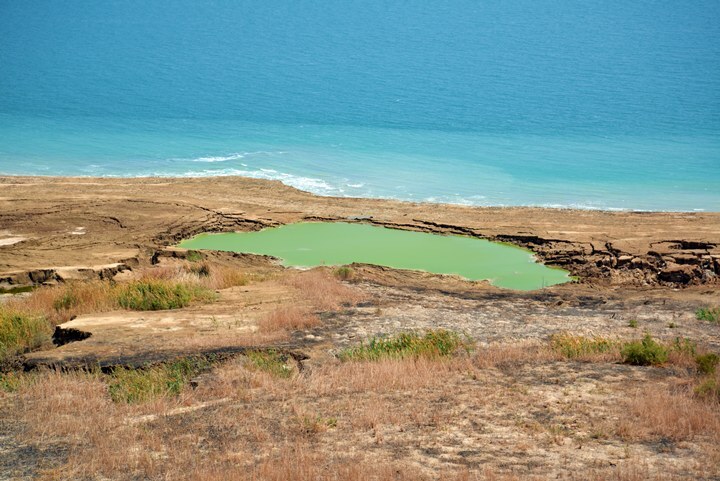 One of the natural phenomenon is the recent appearance of sinkholes, as seen in the photo below taken along the shore of the Dead sea. The sinkholes are caused by the formation of underground cavities as a result of the receding salt water, combined with penetration of freshwater which dissolves the salt layers. The deadly sinkholes appear in the area around the lake, creating hazards and swallowing areas and damaging the roads. Sinkholes are seen near the gas station of Ein Gedi. As seen in this photo, structures and trees sank down and the surface became uneven. Ein Kedem is situated along the shore, 5KM north of Ein Gedi. Along this section of the shore, and in other locations between Ein Gedi and Mitzpeh Shalem, are a series of hot springs. The temperature of these sulfuric springs are 42 degrees Celsius. One of these warm springs can be seen on the bottom left side. A panoramic view, as seen from Highway #90 several kilometers north of Ein Gedi, is shown in the following picture. If you press on it, a panoramic viewer will pop up. Using this flash-based panoramic viewer, you can move around and zoom in and out, and view the site in full screen mode. Dead Sea - name of the great lake east of the Judean desert. The lake is one of the saltiest (hence the lack of life) and the deepest in the world. Salt Sea - name in Hebrew (Yam= Sea, Melach - salt). Biblical reference: (Genesis 14 3): "All these were joined together in the vale of Siddim, which is the salt sea". Siddim is based on the Hebrew name "sid" - lime. 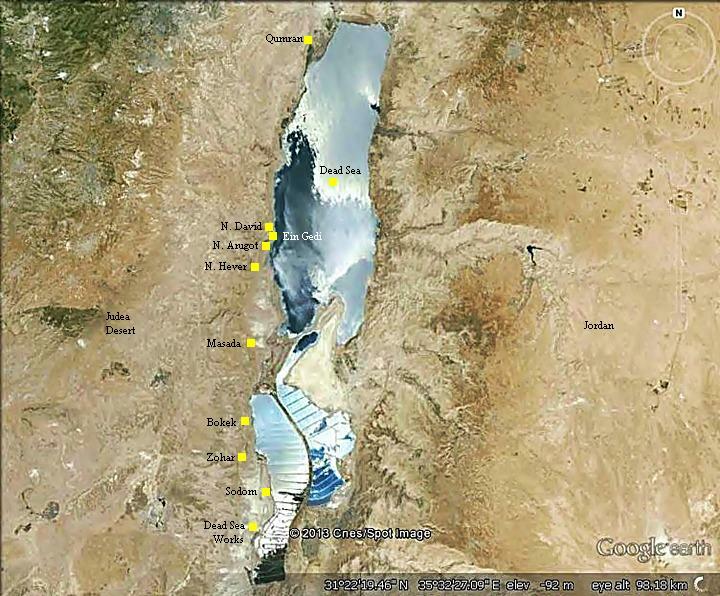 (Joshua 15:5): "And the east border was the salt sea, even unto the end of Jordan".